Nowhere is hockey bigger than in Minnesota, even at small schools like St. Paul Academy and Summit School, which until last year hadn't made the state tournament in 41 years. See the Spartans make a spirited run at another postseason bid. Minnesota is known as the state of hockey. Nowhere else within the United States is the sport more deeply ingrained in the culture and traditions of the locals than in the Land of 10,000 Lakes. And nowhere is that love for hockey more apparent than among Minnesota's high schools. St. Paul Academy and Summit School, a small private school, was once a big-time hockey powerhouse. The Spartans have fielded boys hockey teams since the early 1900s. Theirs is the oldest program in Minnesota, and they were the last team to win the Minnesota Independent School High School Tournament before that event was discontinued in 1974. St. Paul Academy and Summit School, or SPA, also won the Minnesota Prep School state tournament in 1961 and 1962 and fielded several other championship-caliber teams until the 1970s. But since 1975, when private schools were first allowed to play in the Minnesota State High School League state tournament, the Spartans have struggled to stay competitive against bigger programs. After some lean years, SPA made it to the state tournament last year for the first time in their 41 years as part of the MSHSL -- and finished a respectable fourth. With a strong group of returning players, SPA entered the 2016-17 season ranked No. 4 in the Class A coaches poll and armed with high expectations. Coach Matt Funk, who had taken over as SPA's boys varsity head hockey coach in 2016, finally had all the pieces in place to make a real run at a state title. But hockey, like life, can be slippery and unpredictable. ESPN spent the season with the Spartans, chronicling their journey, along with their support network of coaches, parents and team. Assistant coach Charlie Hammel, who is known among the team for his rousing motivational speeches, gives a private pep talk to junior forward Dev McCabe (9) before the start of SPA's game against archrival Breck. A group of parents cheer as the Spartans score a goal against Blake. Over the years, the SPA parents have become close friends. Besides cheering on the team, they travel to away games, host team dinners and banquets, plan carpools to practice, print T-shirts and hats, sell advertising space in the hockey program and organize Teacher Appreciation day. Coach Charlie Hammel's son, Louie, is a frequent fan at SPA's games -- and a player favorite. Senior Matt Dahlseide gives him a pat on the head as the Spartans come off the ice after defeating St. Louis Park. Coach Matt Funk outlines a play for the offense during the intermission of the game at Mankato West. The Spartans have both on-ice and "dry-land" workouts. On-ice practice typically lasts 1 hour, 15 minutes, while dry-land sessions are usually 45 minutes and include drills to develop speed, agility, balance and coordination. Jake Hosszu (kneeling) and Jack Johnston (laying down) do stretching exercises under the watchful eye of SPA's strength and conditioning coach, Gunnar Regan. As the season progresses, the team occasionally substitutes film sessions for dry-land workouts. Freshman defenseman Will Rathmanner rests on the bus ride to Mankato West. The players relax whenever and wherever they can. The long bus trips, time spent waiting in locker rooms, tough practices, intense games, social pressure and homework all add up. But the opportunity to play regularly on a varsity line make it all worthwhile. Every Friday a different family hosts a team dinner. The junior varsity and varsity teams attend, along with their families. It is a great time for everyone to get to know each other outside of school and practice. The boys use the time to blow off steam. Then, the next morning, it's back to practice or a game. Senior Riley Bowman heads into the arena to put his gear away after a long game day on the road. Senior Will Kelly takes a short nap on top of the team equipment bag before loading up the bus for the day trip to Mankato West. Head coach Matt Funk congratulates senior Riley Bowman after the Spartans defeated Minnehaha. After each game, Funk gives a brief summary of the positives he took from the game and discusses areas the team needs to work on. Senior defenseman Weston Lombard (left) and senior center Dom Picciano lace up their skates for the game against longtime rival Blake School. Sophomore Nolan Gifford listens to music and carefully tapes his stick before the section quarterfinal against Highland Park. Each player has his own way of psyching himself for the game. Some go off by themselves and listen to music, while others will play video games or watch SPA's junior varsity game. Senior Jack Johnston (19) listens to the coaches as they describe the game plan before the start of the quarterfinals of the Class 1A, Section 4 boys' hockey tournament against eighth-seeded St. Paul Highland Park. The top-seeded Spartans go on to score four unanswered goals to beat Highland Park 4-1. Senior Matt Dahlseide tallies four points on two goals and two assists, scoring twice within minutes in the third period to put the game out of reach. 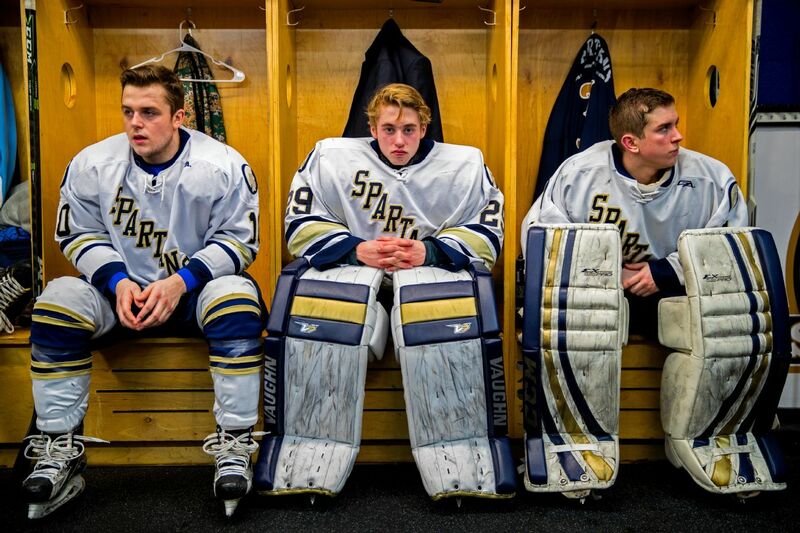 Will Kelly (center) takes a moment to gather his thoughts before the Spartans take the ice in the Section 4 championship game. Andy Beran, the starting goalie, always leads the team out of the locker room and onto the ice. Students decked out in Spartans jerseys cheer on St. Paul Academy and Summit School, the No. 1 seed, during its Section 4 championship game against No. 2 seed Mahtomedi at Roseville Ice Arena. As SPA advanced further into the playoffs, the crowds got bigger and noisier. Senior Sam Petronio leads the team in a locker room chant. Before the start of every game, the team rallies around the goaltender and yells, "We are a team. We are excellent. We are together. We are champions." Mahtomedi scores three goals in the second period to upset SPA 3-1 and advance to the Class 1A state tournament. Seniors Will Kelly (leaning on boards) and Sam Petronio (17) take the loss hard. Seniors Noel Parker (left) and Riley Bowman (right) comfort one another in the locker room after the loss to Mahtomedi. Emotions ran high for everyone on the team, which had expected to return to the state tournament after the previous year's success. It was especially tough for the seniors, who hadn't anticipated that their high school hockey careers would end so soon. As senior Dom Picciano cleans out his locker, he takes a minute to reflect on memorabilia such as the poster of him and junior Dev McCabe that was hanging in the arena during senior night. The coaching staff reviews the season and lays out its expectations for the next year with freshman Thomas Bagnoli. Every player, on both the junior varsity and varsity teams, meet with the coaching staff to rehash the season and identify ways that they can improve next year. All of the players attend some form of offseason training, either by playing for AAA teams and/or at development camps, and through skating instruction and weight training. Many of the seniors hope to play junior hockey or play at some level in college. As the locker room emptied around him, senior Noel Parker wasn't quite ready to leave yet. He contemplates his final high school exit interview with the coaching staff.